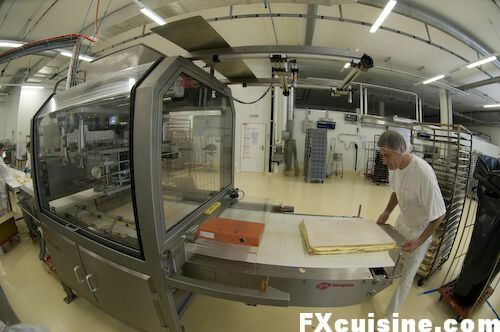 Today I'll show you how the pastry most Swiss eat daily is prepared. 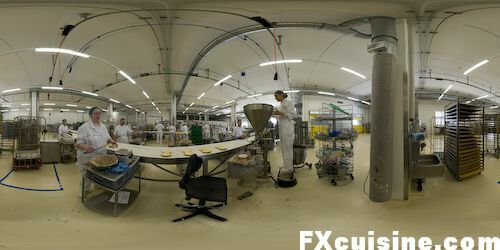 The brand new pastry-making facility of COOP just outside Lausanne kindly allowed me to spend a morning there with my camera. A captivating experience. In Switzerland we don't have Walmart, Tesco or Marks and Spencer. Our supermarket scene is led by two Swiss giants, Migros and COOP, both cooperatives with non profit goals. 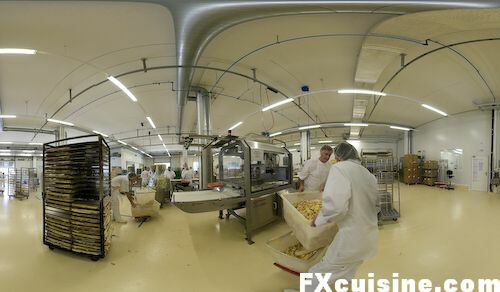 COOP has 45,000 employees in Switzerland and, on top of selling groceries, clothes and all the things one expects to find in a supermarket, they also offer traditional food specialties. I am a big fan of their Slow Food section which sells hard-to-find delicacies such as red cows' milk Parmigiano, white polenta flour from Ticino or San Marzano tomatoes. Every evening every one of the 1400-odd COOP shops in Switzerland sends in its orders for the next day electronically. How many rice boxes, how many bottles of Champagne, and how many Napoleons. A custom SAP system works out the quantities the Aclens facility, which serves Western Switzerland, must produce for the next day. Let's see what happens next. You may point out that these are no match for your grandma's cakes, and I would agree, but we would both miss the point. The fine people in this industrial bakery strive, day in, day out, to bring the best quality fresh pastry the majority of people will be able to afford. Certainly, a thousand layer cake by Pierre Hermé is made from better material, but to spend 100 Euros for a birthday cake? Students and many families, even in Switzerland, live on a budget. Do you like Japonais pies? Let's see how you can turn out 100 pies in under an hour. The night crew has baked a number of sponge cakes and cut each in half horizontally. 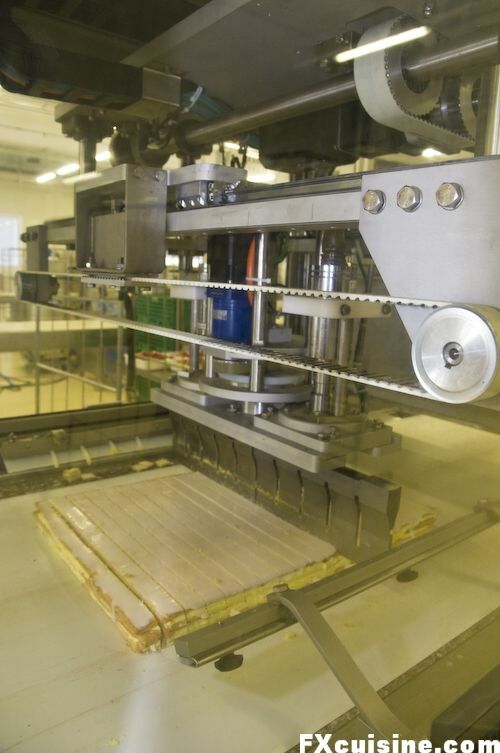 The cake halves are placed on a conveyor belt to be assembled. See a 360° Panorama (1.5 Mb full screen) or 2000-pixels equirectangular panorama (plain vanilla JPEG 150Kb ). 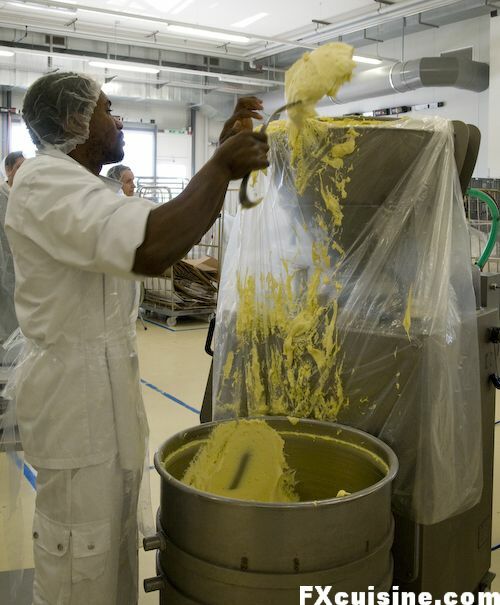 Each sponge cake half is placed on the automated cream wheel, the real soul of the pastry. The lady turns the machine on with a food pedal and off it goes, rotating the cake while pouring the filling on top - always the exact same amount. The cakes are then placed back on the conveyor belt. Next stop - spreading and weighing. This lady checks the weight to make sure there is no excess of filling (that would just be too filling) and spreads the cream with a large flat knife. ...until finally they are stacked up on a tray. 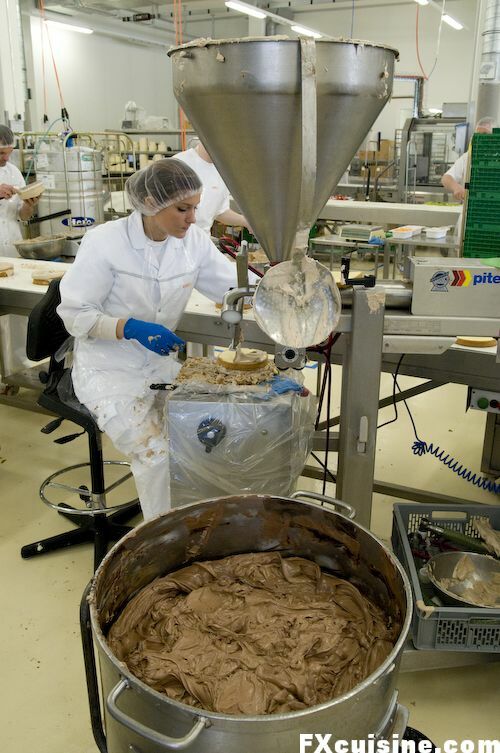 Bits of almonds that fell off the pies are collected in a plastic box at the end of the belt. Clean and efficient like a Swiss clock. If only you could lay down and rest your head on a pillow below the conveyor belt, you would never again have to worry about having enough calories to last the day. 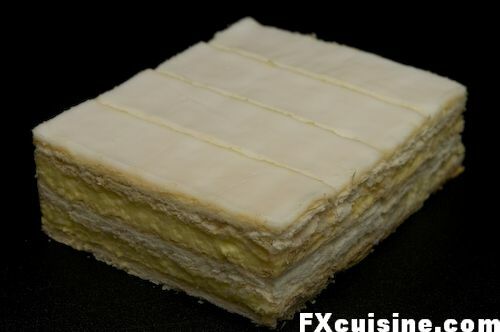 In French Napoleons are called mille feuille, or 'thousand layer cake'. Not another example of French hubris but rather a precise mathematical observation. 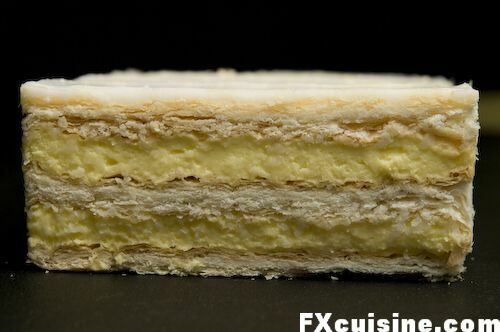 When properly made, the puff pastry used to make Napoleons is folded 10 times in half, yielding 1024 layers in one single thin sheet of puff pastry. As you can see, there are three such sheets per Napoleon, which makes for 3072 wheat-butter layers in one Napoleon. A real treat for geeks to impress their girlfriends with raw brainpower. 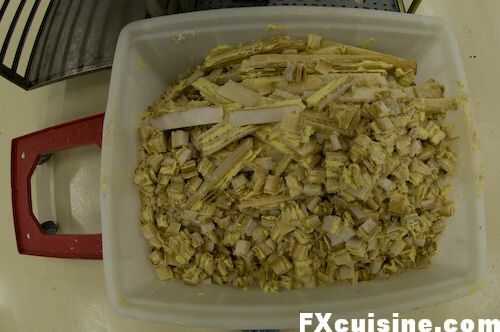 See how you can turn out 7200 portions in under an hour. This gentleman is filling the pastry cream into a huge funnel to fill the space between two sheets of puff pastry. When I arrived, a batch of Napoleons had already been prepared in large 1 meter square trays iced and stacked up, ready for the guillotine. Cutting a Napoleon down to size is no walk in the park, even with a one-man-portion. Everytime I try, the custard oozes out from all four sides and the Napoleon is empty by the time the blade touches the plate. How in the world can you manage to cut 7200 miniature Napoleon and not spill a drop of custard? This gentleman carefully places a sheet of Napoleon in a huge and very expensive machine. The Napoleon is immediately painted with various ominous-looking red laser beams. His time is up. The Napoleon slides into the machine and is immediately cut down by an automated ultrasonic blade. The $25,000 ultrasonic blade vibrates to prevent the cake from breaking. In a couple seconds it recognizes the size of the Napoleon, decides how many pieces to cut and cuts them. Bang, bang, bang, the cake is cut 24 times lengthwise. The blade moves up, waits a second, then turns at a 90 degrees angle and pounces back on the Napoleon like a bird of prey, cutting it crosswise three times. Its job done, the machine spits the Napoleon in the back with its conveyor belt. The edges, too tiny to make proper portions, fall off in a huge plastic crate below, under the vigilant eyes of the operator. ... and our operator soons needs to move it. 'What do you do with it? ', I ask. 'I guess we could bring this to a school and the kids would only be too happy to eat as much as they can,', he jokes, his face gleaming thinking of the scene, 'but in fact we sell it to a farmer as pig food', looking more serious now. Click on the picture for a 2000-pixels panorama (JPEG, 250Kb). 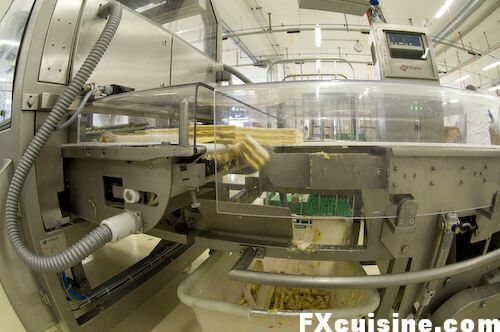 On the other side, a packing detail waits for the Napoleon portions to exit the machine. Napoleons are packed four to a box. Here are the four I bought from a COOP shop the next day. Each Napoleon sheet yields 72 rectangular portions. How many layers does that make? The operator reckons 100 sheets times 72 is 7200 Napoleons. Yes, but how many layers? Three times 72 millions, each portion having three layers of puff pastry of 1024 layers each. The master of Napoleons, for that makes 1024x100x72x3 = 221'184'400 layers.